After four months alongside Newark Quay, the dumb barge AMT DISCOVERER left the Clyde on Saturday afternoon, in the charge of the Portuguese tug RED DOLPHIN, a vessel which is no stranger to the river. The duo were heading for Liverpool. 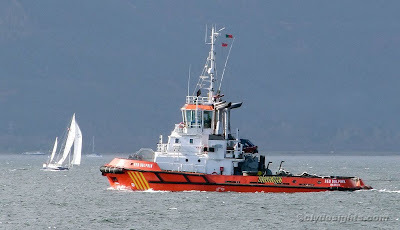 The 85-tonne bollard pull tug RED DOLPHIN, on charter from her Portuguses owners to Svitzer, took over the tow off Greenock from SVITZER MILFORD and AYTON CROSS, the two local tugs that had moved the barge from her berth at Port Glasgow. Having arrived at Port Glasgow in December, Ferguson Shipbuilders spent several months preparing the barge for her next task, operating as a cable layer for Subocean. In addition to cable-laying equipment manufactured at Renfrew, twelve accommodation modules were added to the barge, plus additional stores, galley, office, and recreational facilities. The barge will operate in European waters, primarily working on various wind farm projects around the UK over the next two years.